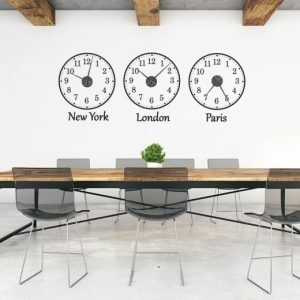 Finding that perfect style clock for any room in your home can be difficult, you want something that makes a statement and perfect represents your personality. The one pain about hanging a clock, however is faffing around with actually having to put the nail or bracket on the wall, getting it straight and actually managing to get the clock to stay up. At Wall Chimp, we’ve come up with a creative and quirky way to combat the whole hanging and making a mess in the process of putting a clock up, instead we’ve created some pretty funky wall stickers that represent clocks. All you need to do is find the clock wall sticker that best suits your style of room and personality, attach the clock mechanism to the wall and you’ve got yourself a carefree incredibly stylish wall clock! However, finding that perfect style for you and matching it a room can be tricky, so at Wall Chimp, we’ve picked out some of our favourite designs for you and which room we think they would go best in! The one room in the house that’s guaranteed to have at least one clock in! As it’s probably the most used room in any house also, why not have something that stands out, starts up a conversation and perfectly captures your own personality. We’ve got a few options at Wall Chimp, which we think are perfect. Roman Numerals: The perfect traditional style and ideal for that rustic touch. Funky Numbers: Add a bit of fun to the kitchen wall! The design will work well in most settings and with any colour.